"Hey there! I'm Mickey. 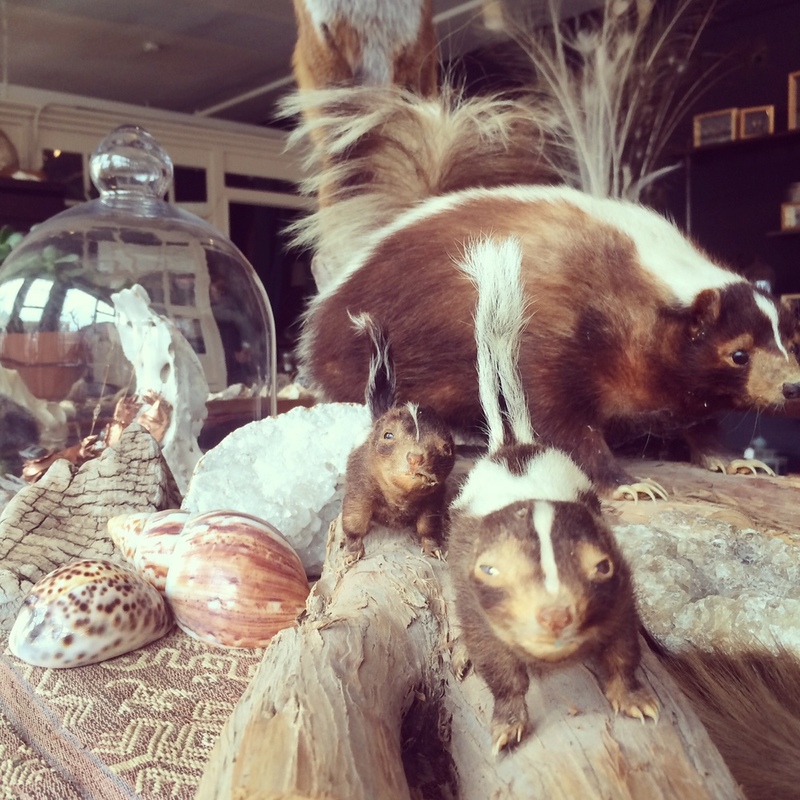 I'm a Midwestern taxidermist and craftsperson. Born and raised in Michigan, I took an interest in nature and biology from an early age. My obsession with animals, coupled with a desire to hold onto tangible memories, led to an unexpected intersection. My passion for taxidermy was discovered one night with a dead squirrel, a bottle of wine, and an old biology textbook. I have been working in the taxidermy industry since March of 2012 and I'm recognized internationally for my pop-up taxidermy workshops for beginners. Additionally, I have practiced metalsmithing since 2004 and create handmade, one-of-a-kind jewelry pieces inspired by natural history and the occult. I practice sustainable taxidermy methods, am a member of the National Taxidermists Association, and have worked, volunteered, and taught at museums and universities all over the world. Last year I won a third-place ribbon for my peacock (his name is Kevin) at the NTA National Championships. I have also served as a consultant to novelist Lauren Beukes for the award-winning book Broken Monsters. You can read a bunch of articles and watch a bunch of short documentaries about my work here. My lectures are primarily targeted towards those with an interest in biology, science, and natural history and focus on the role taxidermy plays in understanding the past, present, and future of our ecosystem. I reside in the Logan Square neighborhood of Chicago with four living pets and a whole lot of dead ones. Want to know more? Read my FAQ. Interested in seeing photos of the taxidermy process? Follow along on Instagram." *Also stick around for July First Friday - Mickey will be showing off and selling her work and her jewelry during our First Friday Crossroads Artwalk! Join us Friday July 6th, 6-9pm for some beverages, art, and a good time! 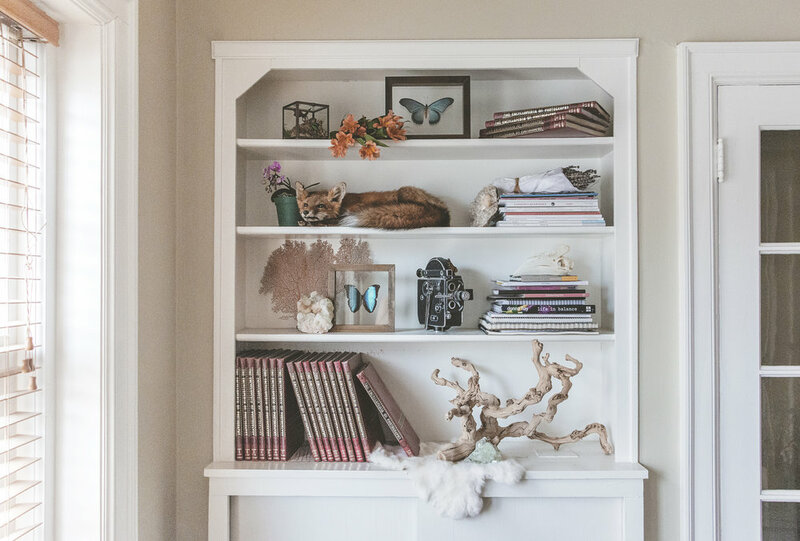 Taxidermy has been having a trendy moment of late, recalling it's glory days during the Victorian and Edwardian eras when it was considered a means to display one's worldly elegance and education to bring taxidermy and framed specimens into the home for beautiful decor. The art of taxidermy has come a long way from it's humble beginnings, when hides were tanned out of simple necessity for protective clothing and shelter. Eventually, scientists sought to preserve animal skins for ease of transport to facilitate their study - with little regard for artistic or anatomical integrity, these skins were stuffed with cotton, saw dust, rags, etc. The resulting pieces bore little resemblance to the actual animal and looked, in the vernacular of our times, busted. The process became more involved and refined with innovations in tanning and technique, such as creating anatomically correct body molds from wood and wound string, and making extensive drawings of the animal for detail references and tracing exact outlines of the carcass for scale. During the Victorian era it was in vogue to bring the wilderness into the home to showcase tokens of exotic travel, so taxidermy made a move from exclusive museum display into the houses of the aristocratic families. We are down with this, as you can see, because we are also well-traveled and fancy. Because we love bringing natural science specimens into the home and believe that everyone who loves taxidermy should be able to do so, we are running a huge sale throughout May on ALL OF OUR TAXIDERMY, up to 50% off!! 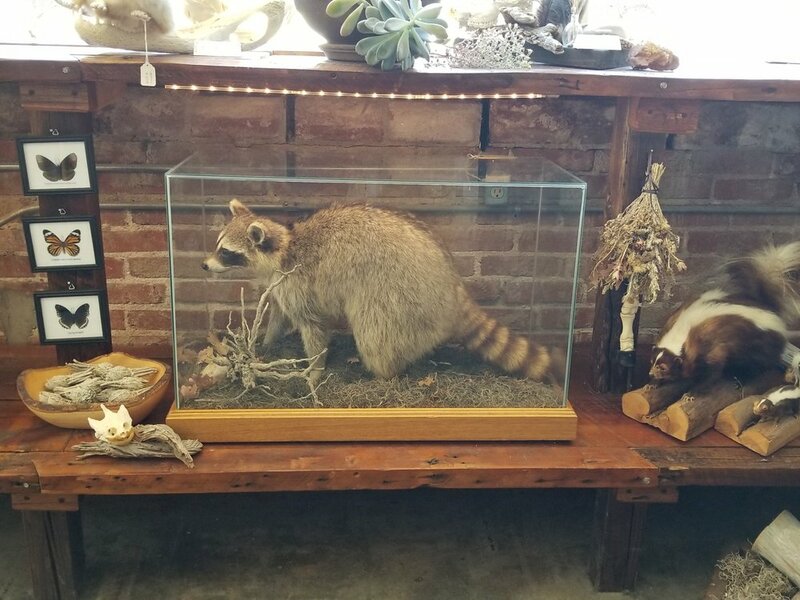 We have new freeze dry taxidermy pieces, shoulder mounts and full mounts, as well as part of a private collection from a former home zoo with beautiful custom-made glass and wood display boxes for the specimens! This is a great time for you to add to your own collection, or develop a taste for bringing the outdoors inside! Martha Ann Maxwell, pioneer in taxidermy and lifelong vegetarian. We love the KCUR program Central Standard, big thanks to Gina Kaufmann, Sylvia Maria Gross and Matthew Long-Middleton for inviting us to be a part of this dialogue on such a fantastic show! My personal favorites in the shop. Funny little skunk baby squashfaces. One of the number one questions we get asked here at Oracle is, "what kind of animal is that?" Fallow deer are native to western Eurasia, but have been introduced all over the world. This species has more pronounced spots during the summer months, but they keep their mottled coat through their adulthood. The males have antlers which are broad and paddle-shaped - almost moose-like - though in the first two years the buck's antlers are just a single spike. There are four varieties: the Common fallow (featured) with a chestnut colored, spotted coat and light tail edged with black; the Menil - darker in color with more prominent spots and no black cloloring around the rump area; the Melanistic, which sports an all-black coat; and the Leucistic which is white in color, but not albino. We are perhaps biased, but we think they would make a beautiful addition to your natural science and curiosity collection - come see! Fallow deer skull with assist from badger spine, coyote pelt, geode, and coyote skulls!